The early years of the 20th century were a time of innovations. The automobile had come to stay. People enjoyed the new fashions brought about in the wake of the First World War. With the vote, women had reason to hope that their social status would change for the better. It was also the decade during which national prohibition, or “The Great Experiment”, was underway. In the town of Mendocino, the voting population, meaning men only, had decided to do away with liquor and its sales in advance of the rest of the country, during the summer of 1909. Many of the arrests and cases brought against those who broke the local option occurred in and around Mendocino. The prohibition against alcohol didn’t prevent people from making, selling or drinking it. The term “blind pig” began to be seen more frequently in the pages of the Mendocino Beacon. Historically, this phrase has uncertain origins, but it is sometimes used synonymously with “speakeasy”. Decades before the advent of Prohibition and the 20th century, “blind pig” was used to describe an establishment where clients were brought in to see a curiosity. Clients had to pay a fee for the privilege of seeing a “blind” or sometimes a “striped” pig and after doing so were given a glass of spirits. This was a way around the direct sale of alcohol — folks were paying to see the “blind pig.” A speakeasy is more closely associated with the years when the nations’ citizens lived under the Volstead Act. One would approach the door of an establishment, which sometimes had a street front masking the real goings on inside, and a password or secret phrase had to be given in a low voice, or spoken softly, before admission was granted. One of those entanglements with the law occurred in May of 1913, when “Angelic” Mike Nolan was fined $400 for “selling liquor in dry territory.” The newspaper reported that this fine represented “about the fourth time” that Mike had been penalized for similar alleged activities. In November 1915, Mr. Nolan’s name appeared in the Beacon once again, having been “. . . caught in the act of selling a bottle of whiskey to one, James Williams.” Only a few months after that, in January 1916, there were 14 indictments issued against people who allegedly had sold liquor in dry portions of Mendocino County. 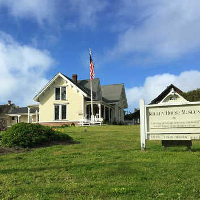 Of those 14, three were residents of Mendocino: Horace Nichols, Billy Grotz and Michael D. Nolan. Both Nolan and Grotz were chronic offenders. Sheriff Ralph R. Byrnes and his deputies had been doing their duty. It is unclear as to when or why Mike Nolan received the descriptor “Angelic” before his name. It may have been due to his association with the young girls who wore wings on their backs for the July 4th parade of 1902. 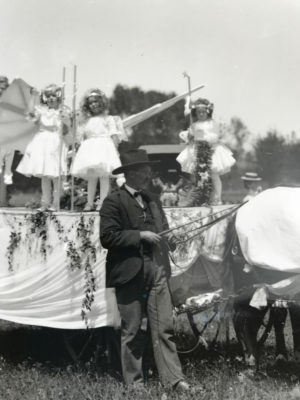 He held the reins of the team of horses pulling the float that day, or at least he did when the photograph was taken. Perhaps Mike Nolan was considered angelic for making alcohol available to the populace, at his own risk, during the dry years. If you’d like to experience the thrill of a speakeasy, make plans to attend the Kelley House Emporium & Speakeasy Cocktail Party on October 6 beginning at 5:30 p.m. at Crown Hall. For tickets please call 707-937-5791 or visit BrownPaperTickets.com.